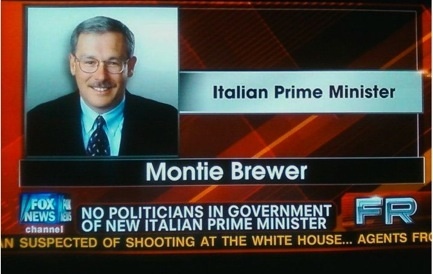 According to my source, this appeared during a report on the November 16, 2011 Fox Report. Although the graphic was corrected the next night, when another report on the situation in Italy ran, there was no correction or acknowledgment of the error the night before. Well, we are talking about the network that regularly posted a picture of Osama bin Laden over the name of Barack Obama — and, just recently, posted a pic of President Obama of the name of Mitt Romney. Hey — who has time to fact-check when you’re in the propaganda business . . . In the head of Fox News apologists: Well, them’s just furinurs… so who cares ‘bout dar felin’s?! In the head of Fox News CEOs: And to think… I scoffed at Rupert for wanting to run a hate group like a business!